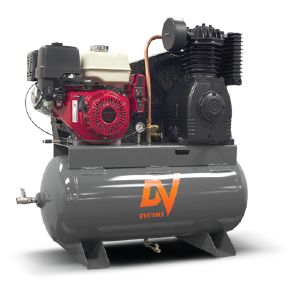 These heavy duty Portable Gas Compressors are pressure lubricated and are extremely reliable, easy and economical to maintain. 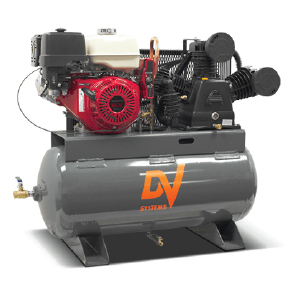 The Honda engine matched with the DV Systems 247 pump make for a rugged compressor. These units are available as either base mount or mounted on a 30 gallon tank. This compressor is also equipped with electric start. These simple, strong and economical Standard Duty Industrial (SDI) Series Portable Gas Compressors are ideal for light industrial, commercial and professional applications. 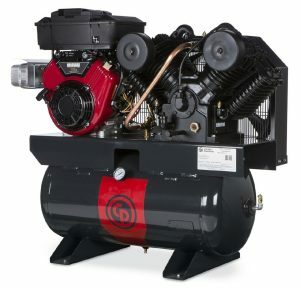 This larger gasoline powered air compressor from Chicago Pneumatic boasts an impressive 35cfm at 100psi. Maximum pressure setting is 175psi.